At the talks, the two leaders expressed their joy at the fine development of the bilateral relations of traditional friendship and multifaceted cooperation over the past nearly 70 years since the establishment of diplomatic relations in 1950. 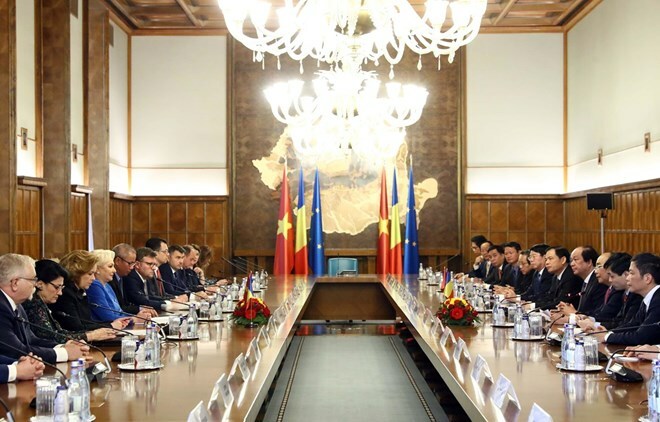 The Romanian leader affirmed importance to the relations with Vietnam and stressed that the ongoing visit by PM Phuc is an important milestone in the bilateral relations. She also spoke highly of Vietnam’s socio-economic achievements and rising role in the region and the world over. Following the talks, the two leaders witnessed the signing of a cooperation memorandum of understanding on agriculture, animal health and food safety, and chaired a joint press conference on the outcome of the talks.